These are the most common questions received of the Taxation for Freelancers series. I’ve put the most popular in today’s post to give you the head start you need. 1. How do I approach the BIR to register as a freelancing professional or business? The BIR uses traditional terms when catering to tax payers’ needs, so it’s important to use these terms so as not to get confused and end up with the wrong procedures and requirements. For freelancers, you would approach the BIR as two identities depending on how you would like to operate as a tax payer: 1.) As a self-employed professional, or 2.) A business. Each one has it’s own set of requirements, so it’s important to explain to the BIR as clearly as possible what it is that you do for a living. 2. What should a freelancer do if s/he already has a TIN, particularly after working as an employee? He/She should go the BIR and update his/her registration. Tax liabilities of an employee is not the same with someone engaged in business (self employed) and therefore BIR records should be updated. 3. Should I register under my full name or a business name? For self-employed professionals, you can register your business under your full name. This eliminates the need to visit the DTI and other government offices to register a business name. There are however advantages to registering under a business name, such as a professional brand or when operating as an agency or team. You will then need to consult with the BIR for the requirements and procedures necessary to do so. 4. Under what category should a freelancer register under to pay taxes to the BIR? A freelancer would normally register as a person engaged in business that provides services for a fee. Usually your tax liabilities would be Income Tax, and VAT or Percentage depending on your choice. 5. How much in income is required if a freelancer wishes to pay taxes as a self-employed individual? There is no specific level of income wherein a person is required to pay taxes. As long as you are receiving payment, regardless of whether you are gaining or losing, you are required to file your tax returns. 6. What is the difference between a VAT-registered and non-VAT registered tax payer in terms of how much tax s/he has to pay? VAT-registered tax payers are required to pay 12% sales tax on gross sales or receipts. As a VAT-registered tax payer, you can declare your sales tax as zero-exempt if you’re earning foreign currency, such as US dollars. Also, as per the BIR officer I spoke to when I first registered, if you intend to market to local businesses here in the Philippines, they’d be more receptive to working with you if you are VAT-registered. Non-VAT registered tax payers are required to pay 3% sales tax. This is called a percentage tax. Refer to this list of businesses required to file the percentage tax. 7. Since the BIR requires the registered tax payer to have printed receipts made, what should the freelancer do with these receipts when s/he issues digital invoices to their clients? You are required to issue official receipts for every payment that you receive. Hence, regardless of the location of the client you still need to make use of the OR. You may e-mail the OR to your clients or just write the OR and just keep it. The main reason for issuing an OR is for documentation purposes so that the BIR can keep track of your receipt. 8. Could you explain the different books (e.g. ledger, columnar books), particularly what their purposes are? The BIR requires every tax payer in a manual system to prepare and manage various books. Cash receipts book – to keep track of sales receipts every month. You need to break down in a sales receipts the vatable and non-vatable sales and also indicate the Output VAT. Cash disbursement book – to keep track of cash disbursed or issued. Tax payer needs to break down the purchases to vatable and non-vatable purchases and indicate also the input VAT. General journal book – a record of the debits and credits made in the accounts. This is like the diary of the company that tells what are the things that was received or sold and things that were issued or paid. General ledger book – shows the summary of the debits and credits made in each in particular account that the company maintains. 9. How does a freelancer go about computing his or her deductions? The rule of thumb is that the only types of expenses you would deduct from your gross sales or income are those that contribute to the management and growth of your freelancing business. To make things clearer, the BIR website has listed the allowable deductions and the kinds of expenses that do not count when calculating a tax payer’s deductions on gross sales or income. To integrate this to computing for your actual income tax returns, check out the step-by-step instructions and a concrete example in this post: Taxes for Freelancers: How to Compute For Your Income Tax Returns. 10. I decided to stop freelancing for various reasons (e.g. taking on a full-time job as an employee, move out of the country). What should I do with regards to taxes? You will need to file a cessation or closure of business to avoid any penalties with the BIR. 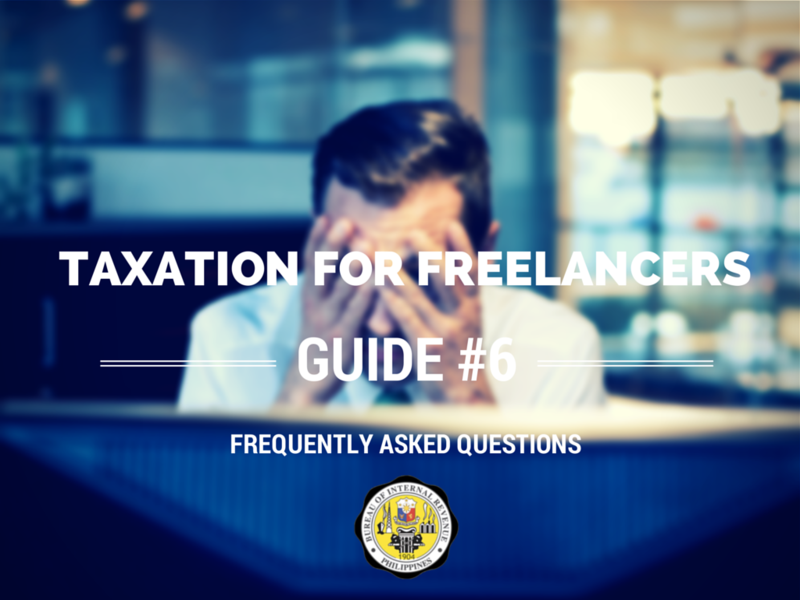 Check this post out: Taxes for Pinoy Freelancers: How to File for a Closure of Business. 11. I was not able to pay my taxes on time. What should I do? One of the hardest lessons I’ve learned is that you can’t mess with the tax schedules and due dates. I once was late in filing for my VAT returns, and so the BIR required me to pay P1,000-P2000 in penalties. If you at any time did not file your tax returns on time, address the problem immediately by visiting the BIR and have them compute the penalties you need to pay. This is the only way to ensure that you do not have any liabilities or bad cases on your account. Of course, the best move is to always pay and file your taxes on time. 12. I have a question about taxes that isn’t related to registering a freelancing business or as a freelancer. I also have questions about a specific situation that none of your posts addressed. All of my Taxes for Pinoy Freelancers posts are meant for tax payers who are registering as freelancers, freelancing businesses, and self-employed professionals who render services to consumers. If you have a tax question or concern that isn’t covered in any of these posts, the best people to ask is the Bureau of Internal Revenue itself. Approach the Officer-of-the-Day with all of your questions so they may be able to answer them fully during your visit.